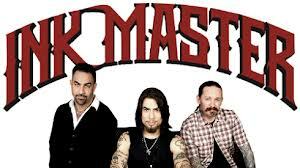 I find myself really interested in the TV show Ink Master. Before you say it, yes, I should get back to my hobbies and stop watching TV. I have so many half finished projects that all of the internet should rise up and scold me for not sticking to the topic. I just can’t help myself. And for a lot of people, TV is a hobby. It just shouldn’t be mine. I watch the show, and I have so many questions. First of all, should you be getting a tattoo with a time limit? I understand the need to put a limit on someone for a television show/competition. Without time pressure these people could certainly all put out some works of art. However, would you want your tattoo artist to feel such pressure? Despite remarkable advances in laser erasing, these things are still pretty permanent. I am guessing that there must be some kind of consolation prize for these people. I wonder what it is. I wonder if it could really be enough. Would you get the seven legged spider tattoo if your prize was a Toyota Corolla? Maybe it’s cash. Maybe it is a pre-paid gift card for tattoo removal. Maybe the need to be on television is so great, your skin is really a secondary concern. I guess I could liken it to a hair cutting show. Your hair grows back, though. Would you sign up for a show called “Practice Surgeon”? What about “rookie fireman”?–I have an image of them setting your house on fire, hoping they can rescue you and put out the fire. Despite my questions, I will probably tune in tonight before going to bed. Last week I fell asleep, so I have no idea who went home. This isn’t really an obstacle as there will be a recap at the beginning of tonight’s program. Usually shopping at Dollarama means looking for scratch building supplies or looking for some container that I need to organize my hobby stuff. Today I came across a model kit for sale. The price was a reasonable three bucks. Hard to complain about that. 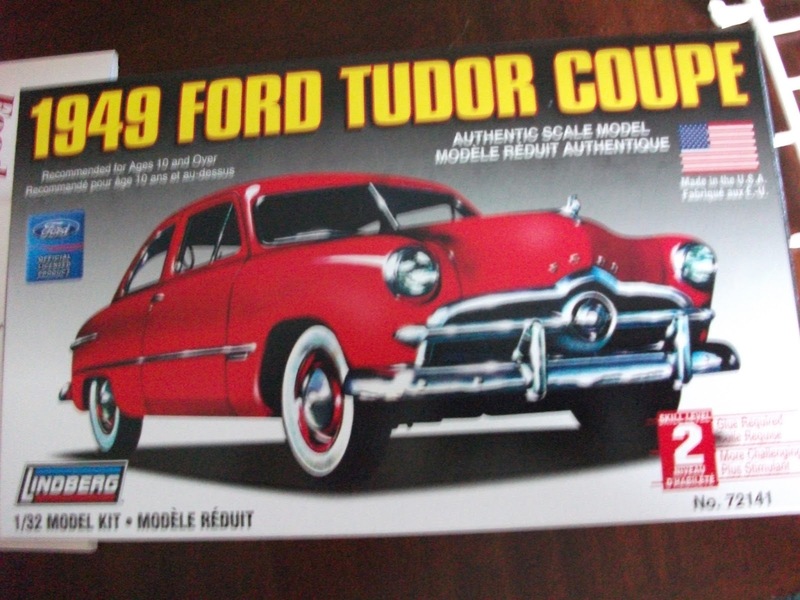 Of course, I once got a 1/24 Scale Ford Fairlane for $2 from Walmart, but since they don’t have models anymore, that was probably an unannounced clearance sale. I really don’t need any more models. I’ve got a shelf full of unbuilt kits, and dozens of other hobbies to pursue–not to mention umpteen household chores that have been the victim of procrastination. I guess curiosity got the better of me, and by writing this, hopefully it won’t get the better of you. You will be armed with knowledge before scouring the Dollarama. So, what came in the box? Watch the YouTube video if you want to see the unboxing. It will give you a good idea of what is inside. Basically, this is a bare bones kit if I have ever seen one. No chrome, no rubber tires, the body comes in three pieces (and those other pieces are the sides, not the hood and truck lid) no engine and no decals of any kind. The wheels are all plastic and need to be glued together. Is this a good kit? Well, for three dollars, I wasn’t expecting a Tamiya masterpiece. I am pretty satisfied with the contents of the box. The mould lines look good, and I don’t see any sink holes or injection marks….so I really shouldn’t complain. With some good painting, and putty to fill up the gaps, this will turn into an acceptable model. I will post pictures when I can. I’ve got some bare metal foil to make the bumpers and grill, and I certainly have enough paint. Mostly, I am probably worried more about what colour to paint it. Red looks good, but I have never painted a red model that I have been satsified with. The Dollarama in my neighbourhood had 3 different models: two convertibles and this one. If anyone finds different ones, please post here. If anyone has completed one, feel free to send some pictures. Readingis one of the joys of my life. I love books and bookstores. I love going to the library–since the books are free there. I have written about reading as though it were a hobby, but I really feel that it is so much more. It is more of lifestyle. Now, I’ve lost my train of thought…..Joanne Kelly….beautiful……ah yes, the Dresden Files. So, basically, I bought the DVD’s of the series. Sadly they only made one season. I have watched two episodes, and I can only conclude that they had some difficulty bringing the story to the screen. The production isn’t bad, but they were certainly hampered by budget, and by trying to cram dense storylines into 40 minutes. The acting is good, but character development seems to have also been hampered by time. Too often the conversations were stilted because they had to give away parts of the plot. I know writing is difficult, but that kind of thing can be tough on a series. It seems to me that the show could have been fantastic. There are moments when the potential is obvious. The source material is excellent….I guess it just wasn’t meant to be. If you have the time, read the books. If you’ve got even more time, check out the series. I remember as a kid being fascinated by some of the stuff my sister had. She is very much into arts and crafts and had lots of stuff like that. She had a glass making kit and a candle making kit. She had a wood burning set and even a jewellery making kit. The best part was that she was actually able to use most of it and she produced some pretty good pieces. One day she showed me her Spiro-graph kit. That was pretty cool. She was older and had greater dexterity, so she was able to actually make the stuff they displayed on the box. I probably didn’t hurt that she also had a lot of patience and was a bit of a perfectionist. I was never able to create the kinds of things that she did. 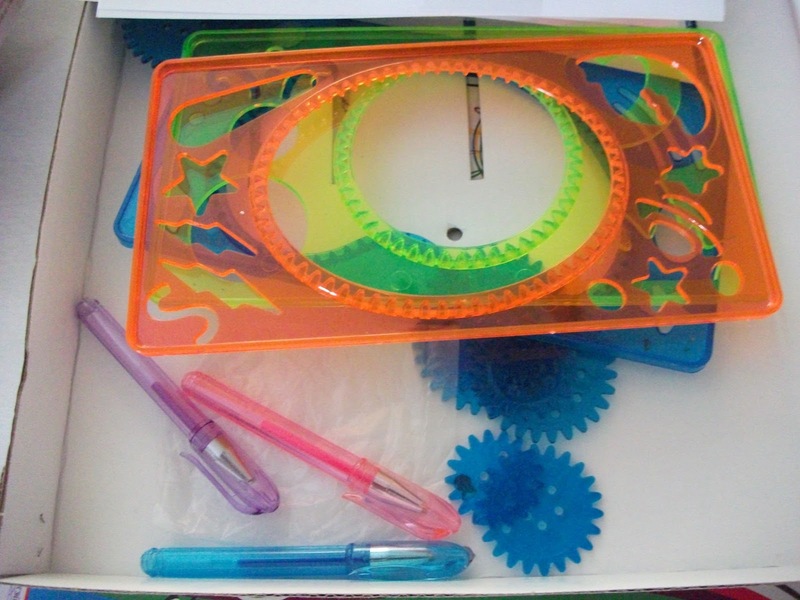 I certainly didn’t have the patience or the manual dexterity. That, however, did not stop me from trying. In the end, if I messed up bad enough, she probably took pity on me and made a good version herself. 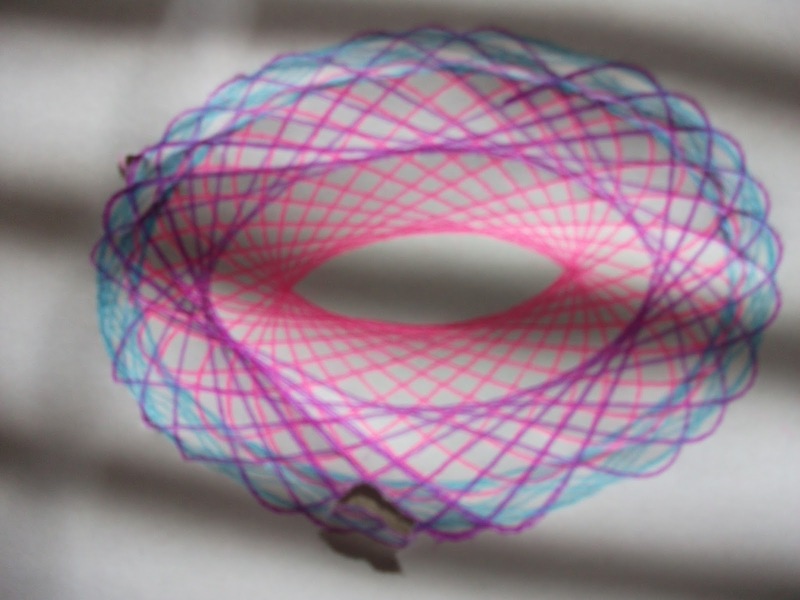 For reasons unknown to me, the thought of her Spiro-graph kit came back to me a couple of weeks ago. Even more peculiar, the idea took hold in my brain and I had a hard time shaking it (kind of like a song you hear on the radio and can’t get out of your head). I went so far as to look up Spiro-graph kits on Amazon and see how much they cost. I even had one on my wish list for a couple of days. Rather than go that route, though it is often my go to route, I decided to poke around an art store. The clerk, who took pity on me, or was just really helpful, told me that they didn’t sell it, but that she had seen the same kind of thing at the dollar store. two dollars is a good price for a box of fun. Short contemplation reasoned that maybe this was the better way to go. I doubt the thing could hold my interest for very long–it’s not as if years and maturity have really solved the patience and dexterity gap–who’s kidding who? Maybe one or two dollars was better than twenty. Surprise, surprise, they did indeed have a Spiro-graph knockoff at the dollar store. So, to get that monkey off my back, I plunked down two dollars, plus tax, and brought home my very own not actually Spiro-graph, Spiro-graph. It was kind of fun, and the designs are cool, but it was harder than it looked to make a perfect design. the gears keep slipping out of cogs….or the cogs slip out of the gears, or….you know what I mean. One week later, I think I have put it behind me. It is no longer an obsessive need, but a curiosity in the jack of all hobbies scrapbook. I am left wondering though, is there an app that can do this for you already? When I tell people I have a lot of hobbies they mostly ask what they are and leave it at that. The more adventurous ones might wonder how I can afford it. Funny though, no one wonders where I keep it all. I have written a couple of blogs about storage, but that’s common to all hobbyists. We’ve all got tools and supplies and various other equipment. It takes up space, but most of that is “out of the way” or stuffed into a closet. There is always room for that stuff. What nobody really stops to consider is what do you do with the finished products. If you have a hobby that results in some finished product, you might want to display it. In some cases you’ve got to display it. Sure, you can give some of it away–some people do crafts that turn into Christmas presents. But, how many times do your family and friends want that stuff? If it is a quilt, you probably don’t mind having six or seven of them, but how many wool sweaters do you want? How many hooked rugs do you need? How many paint by numbers can adorn your walls? Okay, some of these crafts are beautiful. Hence the reason I wrote that you’ve got to display them. Sometimes these crafts are so integral to your life that everyone expects to see them on display at your house. No problem there. I, Jack of all hobbies, however, have so many hobbies, and do not often produce things of display quality. What do I do then? Limits. I have limits. There are only so many of one thing that I can have before it needs to get pared down. 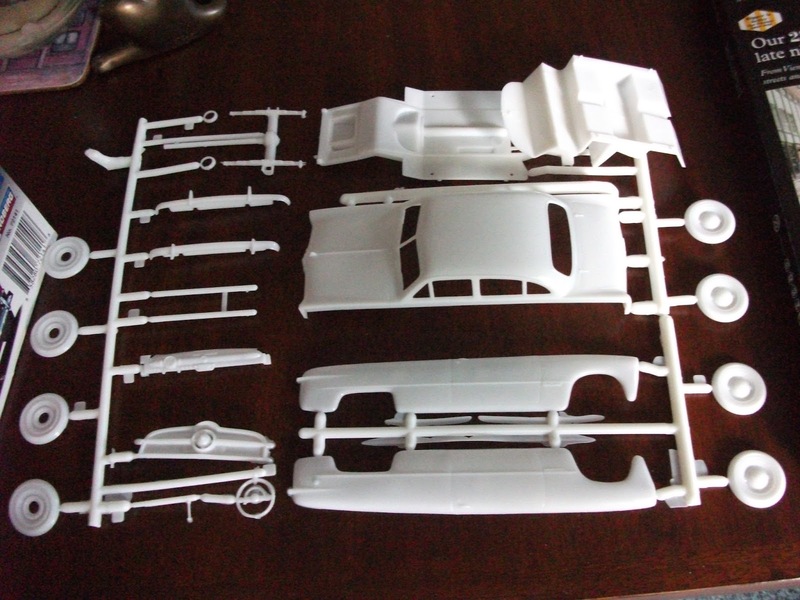 If I make a good car model, it usually displaces a model I am less happy with (though some parts end up in the parts box for that diorama I am going to do someday). I’ve only go so much shelf space, and the better models make the bad ones look rather poor. New magazines displace old ones–or more likely, deluxe editions of books put out by these magazine publishers displace the magazines. Realizing that they had me paying twice, I read the magazines at the library and only buy the books….but this is a topic for another day. Train stuff….well, I can always make more room for train stuff. I am into N scale, and that doesn’t really take up a lot of room…..besides, you’ve got to have priorities, and you’ve got to rationalize. Take my latest puzzle. I did it because I liked trains. I thought about putting it up over in the room where there will be a train…but then I realized that wall space was at a premium, and I had already done a couple of other train puzzles that I thought were better than this one. So what could I do? 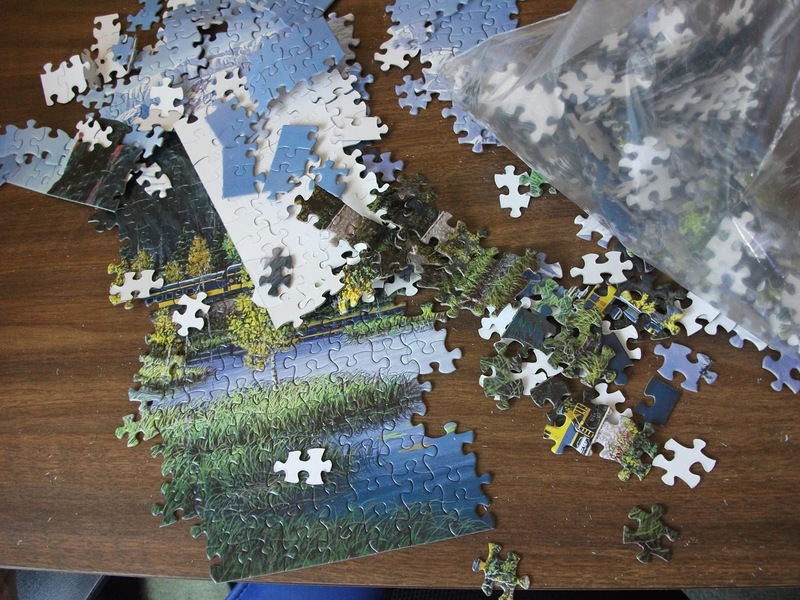 Despite my pack rat nature, I am going to pass this puzzle off to someone else who will have to figure out what to do with it once they are done. As altruistic as the title sounds, I don’t really want everyone to blog, but I wouldn’t mind if they did. I have been blogging for a little while and I am really enjoying it. It gives me the chance to write, and it gives me the chance to put voice to some of the things I am thinking and doing. Recently, a friend has started blogging, and I want to do my best to steer some traffic her way. Her blog is quite interesting, and definitely worth checking out. She is writing about things which are quite universal, and definitely provide food for thought. Here is the link. For the rest of you out there, if you’ve got something to say, blogging might be a good forum for you. It is never too late to start, and never underestimate the power of the written word.